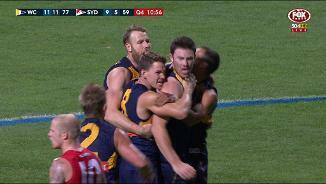 Is LeCras in trouble for this late hit? West Coast recording a strong 26 point win over the Swans. The Eagles won the inside 50 count 5442 and spread harder than the Swans with a plus 45 uncontested possession differential. Luke Shuey with another big performance for the Eagles tonight. He has had 30 disposals (12 contested), six clearances, an equal gamehigh seven tackles, nine score involvements and a goal. West Coast's senior players have stepped up in the last quarter, with Chris Masten (eight disposals) and Matt Priddis (seven disposals, three tackles) leading the way. The Eagles are finishing strongly now, having recorded the last ten inside 50s for a result of three consecutive goals. Jake Lloyd kicks a big goal for the Swans, his first goal of the season. He has been a major contributor for Sydney tonight with 26 disposals and a whopping 567 metres gained, a gamehigh in the match. Sydney are pressing hard early in the last quarter. They lead the disposal count 3115, inside 50 count 4-2, and the tackle count 4-2. Will Hayward kicks his second goal of the night to get the last quarter underway. That is his fifth score involvement of the night and he has been the Swans target inside 50 on four occasions, equal first with Lance Franklin tonight. The Eagles have been slightly more effective in tackling tonight, having attempted 90 tackles for 58 effective (64 percent efficiency). In contrast, the Swans have attempted 97 tackles for 58 effective (59 percent efficiency). Sydney have stayed in touch with the Eagles to this point with the help of their setshot kicking. The Swans have kicked 5.1 (31) from this source tonight. A big quarter from Andrew Gaff helps the Eagles to an 18 point lead at three quarter time. Gaff had 10 disposals, three inside 50's, a gamehigh 238 metres gained and a goal in that third quarter. Josh P. Kennedy is doing everything he can to keep Sydney in the game. He has 23 disposals (13 contested), six clearances, a score assist, three tackles, and has driven the Swans inside 50 on four occasions. West Coast have punished the Swans for their turnovers tonight, scoring 7.5 (47) from this source thus far in the game. The Eagles are ranked 9th in the league so far this season for scoring from turnovers. Will Hayward with a timely goal for the Swans. Despite being relatively quiet with eight disposals for the game, he is having an impact up forward with four score involvements (including a goal and a score assist), ranked second for the Swans tonight. Sydney are making the most of their forward entries in this third quarter. Despite having just two disposals in their forward 50, the Swans have kicked 2.0 (12) from four inside 50's. Eagles InterchangeJonathan Giles off due to the blood rule. Andrew Gaff kicks his second goal of the game for the Eagles. He now has 17 disposals (four contested), three inside 50's and four score involvements. A fast start to the third quarter for the Eagles with a goal to Mark LeCras. He now has two goals from his four score involvements, while he has also recorded 273 metres gained to this point in the match. A twelve point lead for the Eagles at half time. They could be further in front after a wasteful quarter in front of goal, kicking 3.7 (25) after recording a 169 inside 50 advantage for that quarter. After the Swans recorded a plus 25 possession differential in their forward half in the first quarter, the Eagles reversed that trend in the second quarter, recording a plus 22 differential in their own forward half. 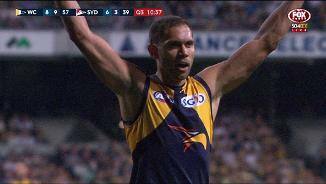 A fantastic goal from Josh Kennedy gives the Eagles some momentum. Kennedy now has a teamhigh four score involvements for the game, including two goals and two score assists. He has also sent his team inside 50 on four occasions. Elliott Yeo is one of the reasons the Eagles have arrested control of this game. He has nine disposals in this second quarter, and a game high 215 metres gained (291 for the whole game so far). The Eagles haven't made the most of their opportunities in the second quarter, kicking 1.5 (11) from their eight entries inside forward 50. Coming into Round 4, West Coast are the 5th ranked team for goal scoring accuracy this season. Eagles InterchangeSam Mitchell off due to an injury. Sydney are continuing to gain the upper hand at stoppages, leading the clearances 116. This is despite the Eagles ruckmen in Jonathon Giles and Nathan Vardy winning the hitout count 22-13. The Eagles have started this second quarter much better. They're getting into the open more often, leading uncontested possessions 3417 and the inside 50 count 5-1 for the quarter as a result. Josh P. Kennedy is leading from the front for the Swans with 12 disposals at 75 percent kicking efficiency, including eight contested possessions. He has also driven Sydney inside forward 50 on four occasions. A close first quarter but the Swans on top, leading the inside 50 count 135 and recording 57 possessions in their forward half compared to the Eagles, with just eleven. Sydney is also spreading well, leading the uncontested possession count 54-41. Despite the game being played mostly in the Swans forward half, and their inside 50 dominance of 115, Tom Barrass is doing a good job of limiting Lance Franklin's impact. Barrass has also found the ball, with seven possessions to Franklin's three. The Swans finally get some reward for effort with a goal to Harry Cunningham. The goal came via a throwin clearance. The Swans are dominating ball-up and throw-in stoppages, recording seven clearances to the Eagles two thus far. Andrew Gaff has enjoyed a fine start to this match. He has six possessions (two contested), a game high 139 metres gained and a goal. Gaff is currently ranked number one in the competition for disposals over the first three rounds. 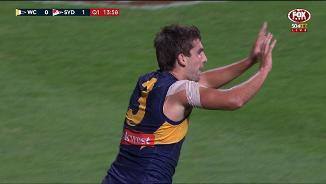 Andrew Gaff opens the goal scoring for the Eagles with their first inside 50 of the game. Gaff averages 0.4 goals per game over his career. The Swans pressure is telling at the moment. Sydney have recorded 13 tackles in the game so far, to the Eagles seven. The Swans are ranked third in the league for tackles so far this season. Eight minutes into the first quarter and West Coast are yet to register a possession in their forward half. Sydney in comparison have had 26 possessions in their own forward half of the ground. Only a few minutes into the game, but the Swans have started strongly with the first six inside50's of the game. They also lead the contested possessions 10-5. Since 2013, Chris Masten has averaged 27 disposals against the Swans, the thirdhighest recorded by a player in this period of time. Sydney is the only side this season that is yet to score from a kickin chain. Josh P. Kennedy won 19 groundballgets against the Magpies last week, the most won by any player in a game this season. West Coast has allowed the opposition to take six contested marks per game this season. This is the fewest conceded by any side. Welcome to Domain Stadium for the West Coast Eagles v Sydney Swans Round 4 clash. WEST Coast has overcome a five-day break and held off a never-say-die Sydney to clinch an important 26-point home win on Thursday night, leaving the winless Swans' finals hopes dangling by a thread after four rounds. 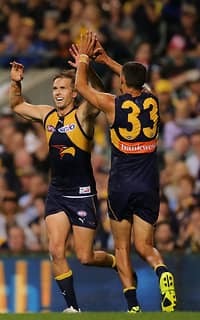 In a contest played with a finals-like ferocity around the ball, West Coast had to dig deep before finally outlasting the Swans in a low-scoring arm-wrestle reminiscent of the great battles between the arch-rivals from the mid-2000s. Despite repeatedly threatening to break away from a youthful Sydney outfit, the tiring Eagles never had the game in their keeping until deep into the last term, as they finally broke away to secure a 13.13 (91) to 10.5 (65) victory. Adam Simpson's men opened up a four-goal lead during the third quarter and – despite their short turnaround - appeared to have enough breathing space after taking an 18-point break into the final change. But with their season seemingly on the line, the Swans threw everything at West Coast in the last stanza, with goals to Will Hayward and Jake Lloyd closing the gap to one-straight kick as anxiety swept through Domain Stadium. However, a cool set shot from Luke Shuey (30 disposals) and curling, bouncing snap by Jeremy McGovern (two goals) gave West Coast just enough breathing space to secure a third win for the season, before Jamie Cripps (two) iced the cake. "They came all night, didn’t they? 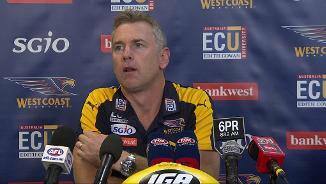 It was an interesting game with us with the effort – it was a good four-quarter effort," Simpson said post-match. "Sydney wouldn't go away, as we expected. You've got to admire what they do, they play such a tough, hard brand regardless of who's playing. "To show that resilience in that last quarter was really good for us off a five-day break." It was a strong response from Simpson's charges after they were questioned for going missing when the heat was at its fiercest against Richmond at the MCG last Saturday. But the injury-hit Swans – last year's losing Grand Finalists - are now remarkably left with a mountain to climb just to feature in September. Since the introduction of the top eight in 1994, no club has reached finals after starting the season 0-4. Not since 2009 have the powerhouse Swans missed out on post-season action and John Longmire is facing his greatest challenge after losing four-straight games in a season for the first time in his tenure. To their credit, the Swans – who had 12 players with fewer than 50 games' experience – refused to give in all night on hostile territory and with Lance Franklin hobbled for most of the match. Franklin ran into a brick wall named Shannon Hurn during the opening quarter, with the superstar forward immediately hunching to the ground clutching his ribs. He struggled to get into a gallop after quarter-time in a major blow to the Swans' hopes of an upset, but still booted two majors to close to within three of the 800-goal milestone. Another ex-Hawthorn champion, Sam Mitchell, luckily escaped serious damage after friendly fire from West Coast teammate Jack Redden in the second stanza. The 34-year-old midfielder crumpled to the ground in agony after Redden's swinging leg collected him just above the ankle. He was helped from the ground and went to the rooms from treatment. Mitchell recovered to play out the second half and looks like he will be available to play against his former side at the MCG next week. The Eagles took a 39-27 lead into the long break, but inaccuracy in front of goal – they booted 5.9 to 4.3 - again haunted Adam Simpson's side. Sydney dominated the opening exchanges and scores were level 14-all at quarter-time, but with Franklin battling the Swans struggled to find avenues to goal. 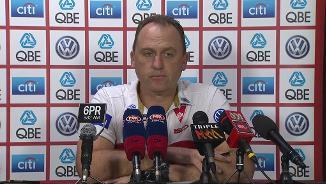 "We thought we started with real intensity," John Longmire said. "Our execution let us down at different times. "We struggled to sustain it (intensity) for the entire game and suffered some bad goals against from turnovers." West Coast's defence has been under the microscope, but led by a superb Elliot Yeo (29 disposals) and skipper Hurn (19), the Eagles stood strong to concede their lowest score for the season. 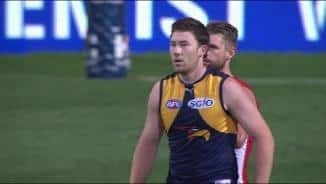 Midfielders Shuey, Andrew Gaff (28) and Jack Redden (20) helped set the tone with their physicality, while the Eagles' forwards shared the goals around. Josh Kennedy (two goals) worked his way into the game, while Mark LeCras' two majors doubled his career tally against the Swans and McGovern offered an aerial presence with Jack Darling (ankle) a late withdrawal. Swans' skipper Josh Kennedy (33 touches) was outstanding all night, with strong support from Jake Lloyd (29) and Luke Parker (27), while Sam Reid tried hard to step up with Franklin struggling and Heath Grundy was a rock down back. But the Eagles' weight of experience eventually told at home, as they notched just their second win from 11 games against their old foes. West Coast: Mitchell is West Coast's main concern but with a 10-day break before facing his old club Hawthorn. The Eagles are confident the 34-year-old will be okay. Sharrod Wellingham copped a corked leg early in the contest but will also be fine. Jack Darling was a late withdrawal with an ankle injury but the Eagles expect him to be right for the game against Hawthorn. Sydney: Franklin is expected to pull up from a corked hip and thigh for the must-win Sydney derby against the Giants next Saturday. Both sides face huge games for entirely different reasons. 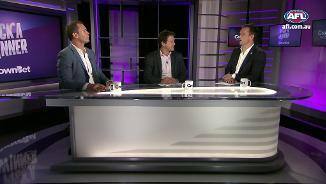 The Eagles travel back to Melbourne to face nemesis Hawthorn at the MCG in a huge test of their credentials, while the Swans are facing a do-or-die Sydney derby with their season in grave danger.